2009-2010 (regular and Multiyear): Data layout not available (blank Word doc at present). The PARCC (Partnership of Assessment and Readiness for College Career is a test that is part of the common core testing consortias. Colorado is a part of the PARCC consortium. The test includes the following subjects: English Language Arts/Literature and Mathematics. The primary purpose of PARCC is to provide high-quality assessments to measure students’ progress toward college and career readiness. The 2014–2015 (fall and spring) administrations of the PARCC assessment included two test windows for the administration of two separate components: the Performance-Based Assessment (PBA) and the End-of-Year (EOY) assessment. The fall administration was offered in a paper based format, and the spring administration was offered in both paper based and computer based formats. The first window was for administration of the PBA, and the second window was for administration of the EOY. A student must have participated in both windows to receive a summative PARCC score. CO PARCC does not report the test "Period"
CO PARCC uses PARCC performance levels and not OH performance levels. Students who have a summative record will have overall measures and claim data available and this data is stored in tables that do not have the "pbaeoy" suffix. If the student took only one of the assessments their data is stored in tables with a suffix "pbaeoy" and overall/claim data is not present for these tests. For reporting purposes this document only focuses on the summative tests so you can ignore the data in the "pbaeoy" tables. 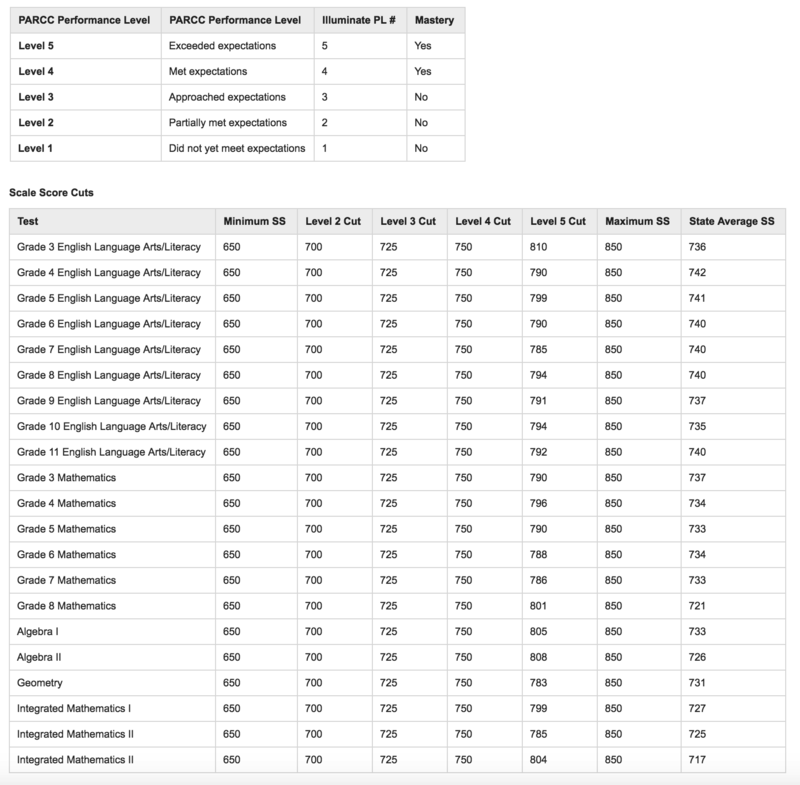 Performance Levels are called Performance Levels for PARCC. The Scale Score range between 650-850 (see above). For English Language Arts/Literacy there is additional Scale Scores for Reporting Categories: Reading (SS Range 10-90) and Writing (SS Range 10-60). There are no Reporting Categories for Mathematics. Clusters for PARCC are called "Claims". The claims for PARCC data only report performance levels which in this case are called "Performance Indicators". Above are the given performance indicators. Illuminate Specifications- This section includes fields that would be used for reporting purposes and information about the import job built in Illuminate for this dataset. 2010-2011 through 2007-2008: Data Layouts not Available.